Having trouble keeping track of the zillion things going on in your life, but can’t seem to find an easy-to-use, down-to-earth task management tool to help you out? Wunderlist may be what you are looking for. Wunderlist is extremely easy-to-use because it is very simple – there aren’t too many features for users to have to deal with. You can add tasks, delete tasks, edit tasks, star tasks, and mark tasks as complete; each task is comprised of the task description and a due date. (NOTE: Due date is displayed next to tasks in DD/MM/YYYY format.) There are categories where you can file each task under, and you can filter tasks by their star-status (i.e. starred or not), their completion status (i.e. complete or not), and their due date (i.e. overdue, due today, tomorrow, in the next seven days, at a later date, or have no due date). 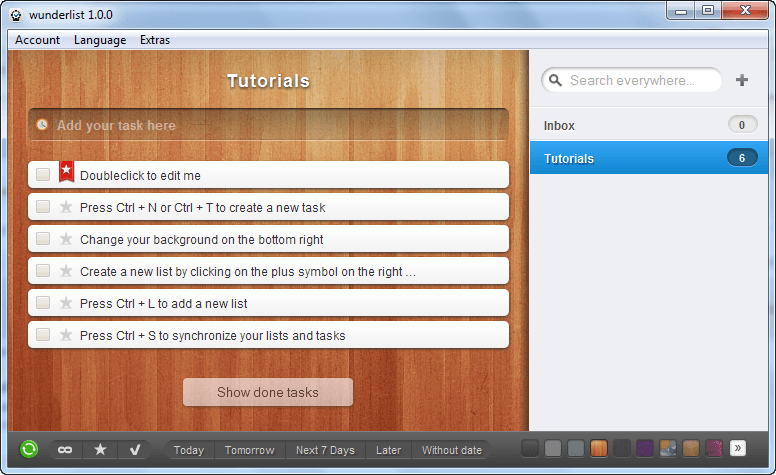 Each task can be drag + dropped within a category (i.e. reordered) or drag + dropped into a different category and there is a search feature available for people that want to find specific tasks. For some the lack of features may be a deal breaker; after all what kind of competent task management tool does not have built-in alarms/reminders and does not allow users to set a due time? For others, however, the simplicity is a welcome feature and the aesthetics of the program (beautiful interface) just make it that much better. Plus there is another reason Wunderlist may win over many users: The ability to sync tasks. Wunderlist is a cross-platform application; it works on Windows, Mac OS X, and has an iOS app. Through Wunderlist’s synchronization feature (you need to register an account, which is free) users can sync tasks between all their computers (Windows or Mac) and with their iPhone/iPod Touch/iPad. Unfortunately Wunderlist does not have an Android, Windows Phone 7, or BlackBerry app – nor does the developer show any signs of adding them in the future – but for those that do use multiple computers and/or have an iDevice, the ability to sync can be extremely useful. That said, forget everything I just mentioned about Wunderlist; just think about the interface. The interface is extremely well designed, with good aesthetics and seamless transitions; and there are nine different backgrounds for the main program section (the area that lists the tasks) you can pick from if you don’t like the default one. Clearly 6wunderkinder have some very talented artists and UI experts on their team. Now I understand this behavior when one is synchronizing tasks lists, but this happens even when I am not syncing the tasks list – even when I have not logged into an account or registered an account with 6wunderkinder. Update: Just to clarify, 6wunderkinder does state that all data synchronization is done over SSL (encryption) and the e-mail address and password is never shared with a third party. 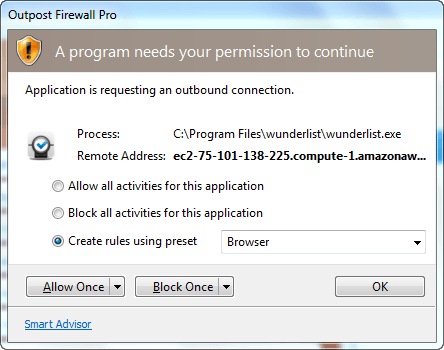 However, there is no further information, such as what data does Wunderlist collect and what is done with that data (i.e. task data).